Phil Vischer ? creator of the global smash success VeggieTales ? has released his much anticipated follow-up: ?What?s In The Bible?. And with the first two DVDs available now, the buzz is already out there. Presenting a 13-DVD series. Each DVD is filled with original music, animation, puppets, and creative writing that will teach kids about God and his Word. The second DVD introduces kids to the book of Exodus: the oppression of the Israelites and the birth and rise of God?s chosen leader, Moses. 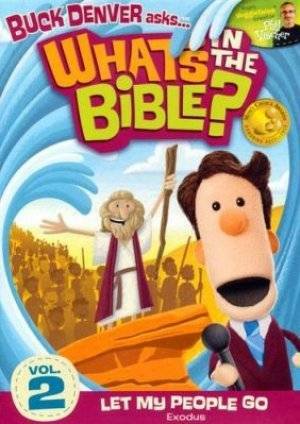 The DVD also answers the question, who wrote the Bible? in a way kids can grasp. Volume 2 "Let My People Go" contains two 25-minute episodes. Episode 1: ?Who chose the books of the Bible?? Buck Denver and friends learn how the Old Testament and New Testament books were chosen to be in the Bible. They also dive into the second part of Genesis to learn how God used a family to launch His big rescue plan! Episode 2: ?What is salvation?? Learn words like ?salvation? and ?redemption? as we dive into God?s big rescue plan ? how He saved the Israelites from Egypt and how he wants to save us from sin ? a tiny word that causes huge trouble. This DVD is Region 0 and will play on a UK DVD player. "I know this was meant for children, but I also learned some things from it. I even shared it with my Bible study group and everyone liked it.. Yes, I would recommend this to a friend." What's In The Bible 2 DVD by Vischer & Denver was published by Friends and Heroes in May 2010 and is our 6355th best seller. The ISBN for What's In The Bible 2 DVD is 858100003465. Be the first to review What's In The Bible 2 DVD! Got a question? No problem! Just click here to ask us about What's In The Bible 2 DVD.